Should You Be Afraid of Airport Body Scans? Or Just the TSA? 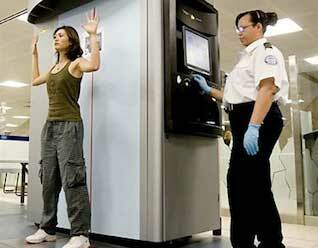 We’ve talked a lot about full-body security scans in airports, as it’s powerful and challenging tech. But should travelers worry about them–or is the Transportation Security Administration (TSA) what they should be more concerned about? issues, with the main issue being lack of full disclosure by the TSA. Some background: Most full-body scans essentially use electromagnetic radiations which are capable of penetrating through clothing but which bounce off flesh. Image sensors then create a picture of your body as if it were unclothed–leaving few places left to conceal weapons or contraband items. The scans are an augmented layer of security, designed to accompany metal detectors and pat-downs, alongside x-raying of your hand luggage. And they’re being promoted all around the world as the next great thing in terrorism prevention, partly in the wake of the underwear bomber. But of course, with a system that effectively renders you naked for some TSA employee to ogle over there will be privacy concerns. And, frankly, these things are such new technology that the public is wary. After all, the concept of being gently x-rayed or illuminated with millimeter-wave radio just doesn’t necessarily seem particularly safe to the lay mind. With these issues in the forefront of your mind, if you were in charge of security wouldn’t you think it wise to be open and informative to the millions of members of the public in your care? So lets set the record straight on the TSA’s behalf: Being exposed to the low-intensity waves from a millimeter-wave scanner is really not much different to sitting at home being bathed in your broadband’s Wi-fi signals and cell phone waves. There’s controversy about these radiations in terms of long term exposure, sure, but the overwhelming scientific evidence is that they’re safe, and that safety umbrella should also extend over millimeter wave scanners. There is some fuss about the potential for the waves in question to damage DNA, which may have future health implications, but for now the majority of evidence weighs on the “safe” side. Meanwhile backscatter airport scanner systems use x-rays, which sounds like a tech the public will be afraid of–when you go get an x-ray in hospital, the nurses are wearing lead protection for example. But each time you’re scanned you’re exposed to less than 0.001 mrems of radiation: For comparison, the safety limit is around 25 mrems per year from a single source of x-rays. In other words, it’s safe for everyone. That about wraps it up in terms of safety for the appliances in question. But the TSA, it would seem, needs to get its act together on this matter–as full-body scanners are going to become ubiquitous whether we, the public, like it or not. like. The images have been removed to avoid any confusion. Folks–a lot of you have got yourselves all in a twist about the image that originally accompanied this piece. There are two things to note: First up, the main thrust of the writing is to highlight how well or badly the TSA appears to be performing when it comes to explaining this (potentially unsettling) technology to citizen travelers who are obliged to face scanning. The issues of personal privacy the tech raises have been oft-debated elsewhere. Secondly, check out the image below. The left portion contains a “mocked up” scanner image, created by inverting a picture of a naked person. The right two are scans from real airport-grade machines. It’s up to you to decide which reveals more “intimate” details of the bodies in question. To peep through the clothing of more news like this follow me, Kit Eaton, on Twitter.